While the Institute of Internal Auditors (IIA) has provided standards and guidelines for the practice of internal audit through the International Professional Practice Framework (IPPF), internal auditors and Chief Audit Executives (CAEs) continue to experience difficulties when attempting to balance the requirements of the IPPF with management expectations. The true challenge for any internal auditor is to appropriately apply the Standards while exerting adequate independence and objectivity in the face of management pressure. Build a value-oriented function that abides by the standards and supports the objectives and goals of the organization.Execute the many aspects of the internal audit, including assurance and consulting work.Build a risk-based audit process.Develop and sustain the internal audit team.Develop and manage relationships with management and the audit committee.Manage internal audit's role in corporate governance, compliance, and fraud. 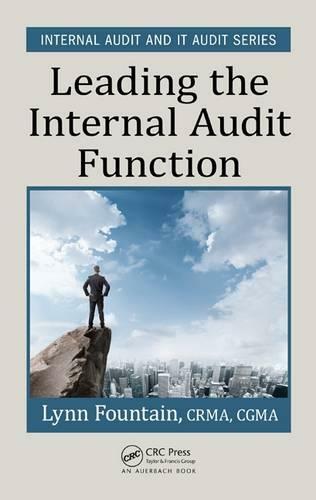 Leading the Internal Audit Function includes real-life examples, scenarios, and lessons learned from internal auditors and CAEs to emphasize the importance of carefully managing all aspects of the internal audit. The author summarizes her many lessons learned into ten "commandments" for both CAEs and internal auditors. By following the guidelines in this book, you should be well-equipped to gain management support, perform effective and ethical audits, and uphold IIA Standards.